Welcome to this month’s Blogorail Yellow Loop. 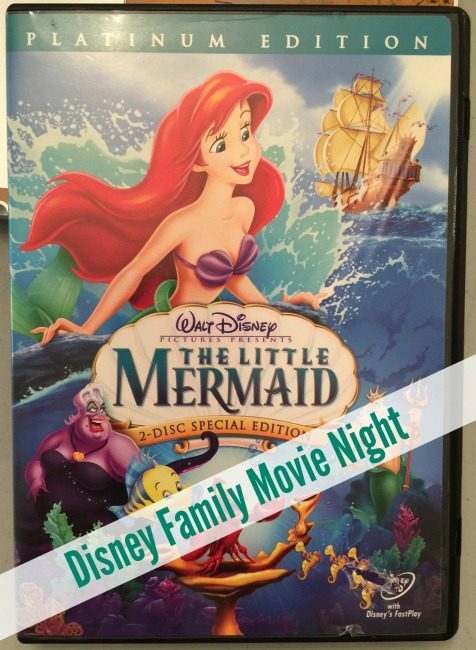 Today we are sharing movie night ideas based on Disney movies from the 80s. We are celebrating Disney movies from the 80s on the Blogorail today! When I approached the kids about their favorite Disney movie from the 80s, Songbird started up her computer to see which movies came out during that decade. Of course, The Little Mermaid was her choice! There is much more to The Little Mermaid than a princess, sand, and sea on the big screen. 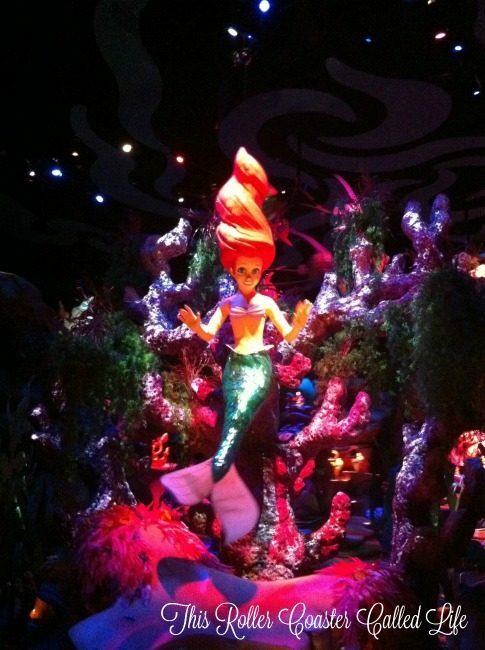 The Little Mermaid also became a big part of the Disney Parks. Let’s take a look at the movie and the attractions it inspired. The Little Mermaid was released in theaters on November 17, 1989. Ariel was the first Disney princess since Aurora was released almost 30 years earlier. If you haven’t seen The Little Mermaid (although I bet you have), Ariel is a mermaid who falls in love with a man who lives on land. Prince Eric. Ariel trades her voice to a wicked sea witch in order to get legs. Ariel has only until before the sun sets on the third day to get Prince Eric to fall in love with her and kiss her with the kiss of true love. Well, you can imagine that Ursula, the sea witch, is not going to let Prince Eric fall in love with Ariel. On the off chance you haven’t seen the movie, I’m not going to give it away, but it is quite the tale. The Little Mermaid was such a hit that it spun off a prequel, a sequel, and a TV show. It has also been instrumental in adding to the attractions and merchandise in the Disney Parks. I know my daughter has purchased (ok, begged for us to purchase) The Little Mermaid merchandise as Ariel was my daughter’s favorite princess, for a time. 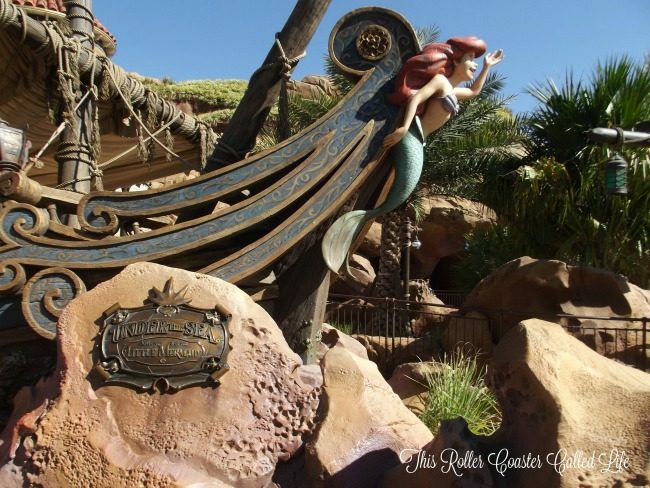 Our first experience with Ariel in the parks was at Disney California Adventure Park. We first went to Ariel’s Grotto in 2007, and my daughter was enchanted. 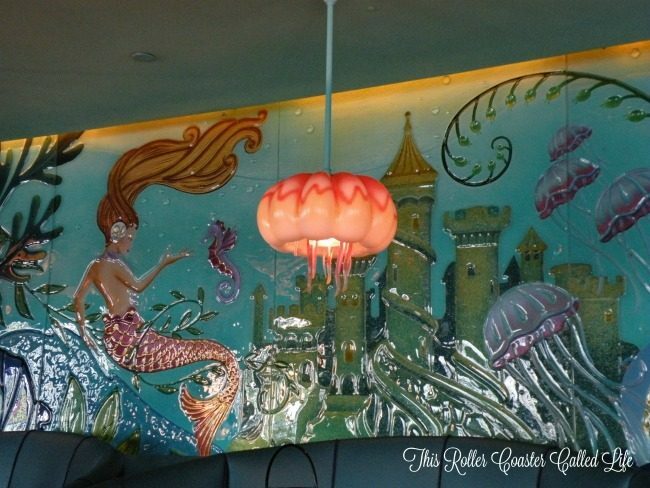 The dining area was decorated to make it look like we were truly dining under the sea. But Ariel wasn’t the only princess here. We met with Ariel before entering the dining room, and other princesses came around to the tables. The Little Mermaid was also given a big part in the World of Color at Disney California Park. 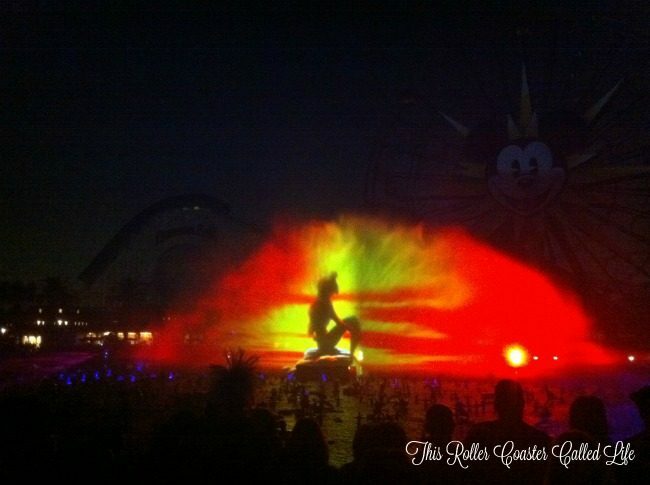 The World of Color is a “water show” with animation projected on water screens. If you have not seen this show, it is a MUST SEE if you are visiting the Disneyland Resort! 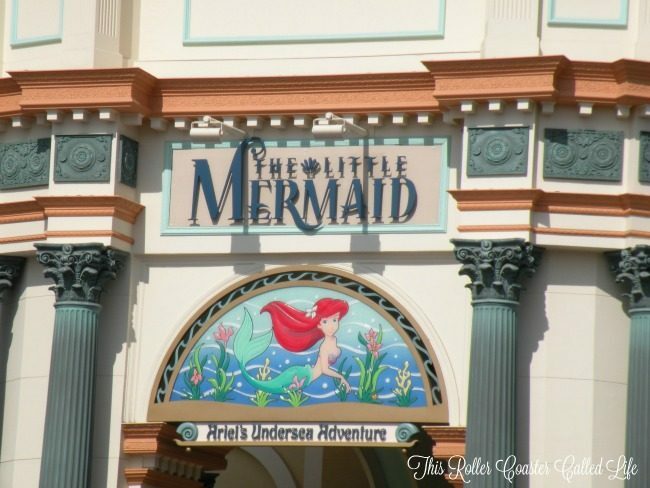 Then, in 2011, The Little Mermaid – Ariel’s Undersea Adventure opened. In the attraction, we rode in “clamshells” which is really an Omnimover vehicle, like in the Haunted Mansion. My daughter could not wait until this ride opened! 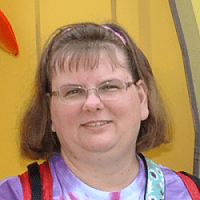 Did you ever hear about “Dole Whip” hair-gate? 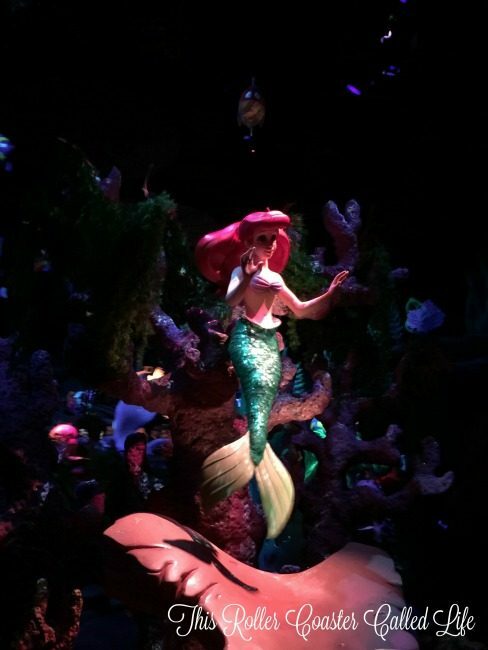 This is a picture of Ariel in a scene with the song “Under the Sea” right after the ride opened. Even though the style of her hair is just as it is in the movie, I guess several people started commenting on her Dole Whip or Soft-serve ice cream hair. After some time, the attraction was shut down for a few days to give her a different hair style. The imagineers added a little hidden character tribute to the Don Knotts character, Mr. Limpet, from The Incredible Mr. Limpet. 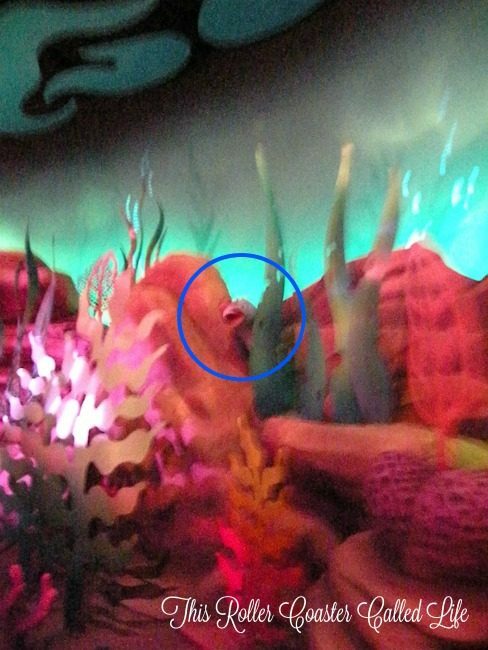 You have to be looking hard to find it as it is behind the clamshells as you come around the back wall of the “Under the Sea” scene. So, let’s hike over to the East coast to see Under the Sea – Journey of The Little Mermaid. I’m not quite sure why it is named differently on each coast. However, I will say that I think the theming is much better over on the East coast at Walt Disney World. It just seems like there is so much more to see at Walt Disney World, and it really works with the other attractions in the area. I wish Disney California Adventure Park had had more room to pull something like this off out there. Notice that they skipped the Dole Whip hair on Ariel from the beginning. 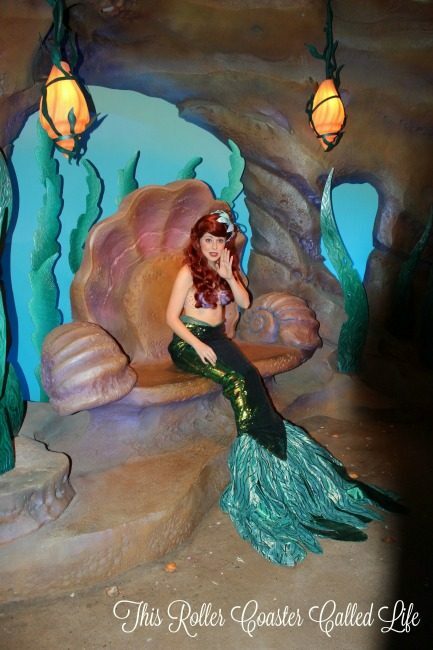 While Walt Disney World doesn’t have an Ariel-themed restaurant, there is a special place to meet with Ariel. 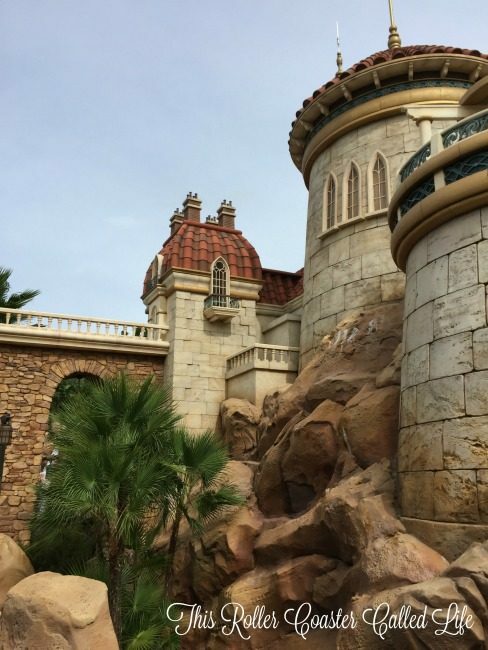 Ariel can be seen at her Grotto next to her attraction. Besides being a fun movie, The Little Mermaid has left a lasting impression on the Disney parks. Of course, you might also see Ariel on the Disney cruise ships, too. What is your favorite Disney movie from the 1980s? I had forgotten about the TV show. I like how you mentioned all the theme park tie-ins! And Mr. Limpet? Too cool! Nice post. My tweens favorite movie is The Little Mermaid , I love noticing all the little hidden characters. I love the Little Mermaid movie and this Under the Sea – Journey of The Little Mermaid at Disney World looks amazing. I want to take my kids there someday. It would be so much fun. I love the movie the Little Mermaid. Great pick for a fun family movie night! This was one of my favorite movies as a kid. The Little Mermaid was one of my favorite movies growing up! What a thorough blogpost! Thank you for sharing all of that fascinating information (and I loved Mr. Limpet, lol). I think The Little Mermaid was a favorite during that time…but so was Toy Story, although I am not sure exactly when that one came out. The Little Mermaid is almost my favorite but is narrowly edged out by Oliver and Company. When my daughter was in school, the music of the little Mermaid was so popular. She had to sing it in her school choir. They did a performance with all the songs. I think she can still sing them today. Too bad about them closing the ride. I didn’t see it at first but after you mentioned it, it did look like soft serve ice cream. 🙂 Looks like a fun park. Hi Sherry! They didn’t close the ride for long. Just long enough to change out the hairstyle. I would love to see this live, it looks amazing and I know the children would be so excited to see this all. I was 13 when this movie came out and it was my favorite Disney movie from that moment. I still know all the words! The Lion King comes in a close second for me though. I love all your pics, it looks like so much fun and I would love it! This was my first return to Disney movies as a young adult. I actually had a date to this movie. Can’t remember the guy so well but the movie is still with me. It was wonderful then and just as wonderful today. I love the little mermaid great movie and story. I really like the idea of a movie themed night. I want to do this with the new movie Kubo and the Two Strings. The Little Mermaid is one of my all-time favorite Disney movies (along with Mulan and Beauty and the Beast). I recently became a Disney World annual passholder, so now I can finally get to experience the “new” ride at Magic Kingdom (with a fast pass of course). I enjoy the show at Hollywood Studios, but I have been wanting to ride Under the Sea – Journey of The Little Mermaid since I heard about it. It looks amazing from the outside. I loved this movie as a kid. Thank you for sharing your movie night. The Little Mermaid is special to me. My oldest niece and I watched this over and over when she was small. Beautiful pictures! I have always loved the little mermaid! Although, I haven’t seen the movie in years. Wow, that little mermaid sure gets around. Haven’t seen it in ages. My whole family (including all adults) loves “The Little Mermaid”. I still have my vhs of the original release of the movie. My sister almost watched it everyday. I had to hide it from her because I was afraid she was going to ware it out.